Camping Lago Barasona är en camping i La Puebla de Castro, Huesca, belägen vid en sjö/en rekreationsplats. Denna terrasscamping har platser med stängsel, med skugga, utan skugga och platser med lite skugga. Det finns möjlighet att hyra husbilar, lägenheter och bungalows. På campingen finns en lekplats och ett sportområde. För den sportige semestervandraren har campingen olika cykelleder. Det finns ett underhållning och ett fitnessrum. Vem vill inte efter en hård dag slappna av i en sauna, en jacuzzi och ett ångbad. Campingen förfogar över en utomhusbassäng och ett knattebad. I den närliggande omgivningen kan du också simma i en sjö/rekreationspool. I Camping Lago Barasona är det tillåtet att vindsurfa och åka vattenskidor. Denna inspektör gör varje år ett besök på Camping Lago Barasona och inspekterar campingen för ca 200 faciliteter och för andra förekommande punkter. Inspektören är en medarbetare från ACSI och arbetar inte för campingen. Not all as it seems. Nice people/bar and a normal sort of restaurant with bar type food. Lots of other facilities, pool (s) and play areas. Do not expect a nice walk to the lake. It is via a drainage tunnel and not recommended. You can walk along the road and cross over BUT there are public warning signs for insects by the lake, so beware. Mosquito bites ! Upper sanitary block is fine, lower one is solar powered so no hot water in the morning. Lower pitches were VERY VERY large plenty of room for large caravan, full awning and car and still room for picnic tables. Flat and well looked after. If you just want to look at the lake from a distance it is fine. Bar on lake was closed in MAY though !!! No boats as advertised so maybe better in high season. Would stay again for the area. Arrived at Graus because we had an issue with the exhaust of the campervan. Had it repaired in the town and arrived at the campsite slightly weary. What a welcome, cheery, informative and helpful. The pitches are large, easily accessible for our 7 metre van as is the service point. The next morning we wanted to get a taxi to the nearby gorge to go climbing, my husband went to the reception area to ask for advice and help. The son of the owner was on duty, he rang 2 taxi firms for prices, told my husband that they were too expensive and insisted that his dad drop us off. We had an amazing day climbing and the owner’s son picked us up late afternoon. They would not take any money for the lifts!! We have been camping/motorcaravanning for over 30 years and have never met such considerate and helpful people. We will be back. Lovely site large marked pitches. Stunning toilet facilities. En suite- toilet, basin and shower with soap and paper all in one cubicle. Excellent. Graus a nice town some 41/2miles away but good cycle path. Strongly recommend. We've been touring Spain with a caravan for 13 months now and this campsite has to be up there with some of the best ones we have stayed at. The site has a lovely homely feel to it. Shower/toilet facilities clean, relatively modern and tasteful with ample hot water and pressure. A beautiful pool and pool area with sun beds provided. Lots of sports facilities both on and off the campsite for those who are that way inclined, or a lovely peaceful and scenic region to explore for sightseers. We loved nearby Torrecuidad, the basillica and its location were quite breathtaking. Motorhomers maybe need to stock up on provisions as the nearest (delightful) town of Graus is approx 5 miles away, although connected to the campsite with a good cycle path. The pitches were a good size and easily accessible, but grassy and bear in mind it rains in Aragon! The surroundings are pretty spectacular and roads accessible but perhaps not for the faint hearted in places, but we managed it fine. This year was our second visit to this site, both visits in September, and again the staff were welcoming and helpful. The restaurant food was basic but good. A lovely peaceful site overlooking the reservoir. Pitches have plenty of space between with electricity and water close to each pitch. Two swimming pools both with plenty of seating area and sports areas for the energetic. Lovely walks over the hills in the surrounding area. We have stayed 3 wonderful days in one of the best campings I've ever been. The camping pitches big enough, shadow or sunny place, no problem to choose. Quite easy to get relax. Good sport facilities. We'll go back for sure. Probably the best site we have stayed on in Spain. Everything was well maintained. The pitches were large and easily accessible with magnificent views. The staff were friendly and extremely helpful. The restaurant was a little expensive but the quality of the food was excellent. Mind the step in the bar!!! We will certainly return when we have more time. Lovely peaceful site - we arrived for an overnight stop mid-September and stayed for 5 nights before having to move on. The staff were helpful and friendly, the pitches a very good size and the bar and restaurant open! Something not always available at that time of year, with a good limited menu available. Good walks in the area and lovely views. We shall be returning whenever we are in the area. Vill du boka Camping Lago Barasona eller få mera information? Det går bra med nedanstående uppgifter. 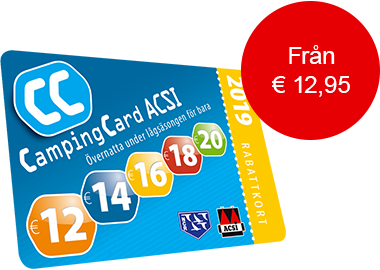 ACSI Eurocampings skickar din informationsförfrågan till "Camping Lago Barasona".